Like every single detail of your wedding, your invitations are also important. Though it may seem like an easy task, it can be made daunting when there are so many options to choose from. Here are some ideas that can help show you the way. Like everything else about your wedding, you'd want your wedding invitations to be nothing short of perfect. Choosing wedding invitations may seem like a very easy task. As a result, most couples mistakenly get to it at the very last minute. Good for you if you already have a clear picture of the wedding invitation you want. If you don't (and you are not alone), you may find yourself overwhelmed by the many beautiful options available. It can be daunting, to say the least, but with any luck, you may get bright ideas right here. Before you start panicking because you don't have wedding invitations yet, take a deep breath, step back, and look at the bigger picture - in this case, your wedding as whole. This includes the theme, motif, and venue. 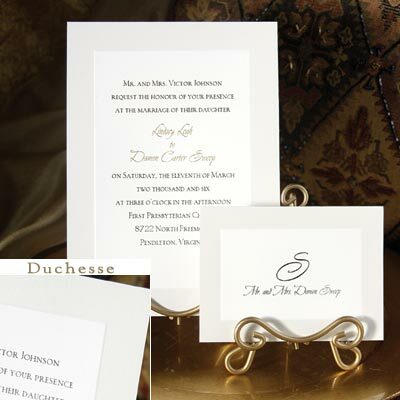 One, a combination, or all three can contribute to the perfect wedding invitation. If you're having a beachside luau, a fun, tropical-themed invitation will be perfect. The print may include plenty of blues and yellows, as well as a snapshot of the venue's picturesque setting to give the guests a preview of what's to come. Thick paper and waterproof ink will also allow the invitation to hold up, just in case a guest gets too frisky in the water. A wedding invitation in a delicate sheet with elegant lettering in water based ink is the ideal prelude to an enchanted ball-themed wedding. With this kind of theme, shimmer is needed and can be achieved with gold, silver, or bronze scripts. Glitter also adds to the glamour, as long as it's tasteful. Too much or too little can make or break such an invitation. You can also have a wedding invitation based on your bridesmaids' and flower girls' dresses, flower arrangements, and even the wedding cake. 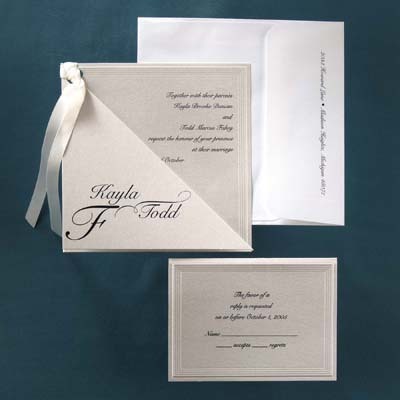 You should also take into account your ceremony's formality when deciding on wedding invitations. You can't use a formal invitation to a casual affair and vice versa. By keeping your wedding invitations appropriate to the formality of your ceremony and reception, you also impart a sort-of guideline that your guests can base their attire and overall manner on. A formal church wedding and a full-course sit-down dinner reception, for example, merits a more traditional approach. 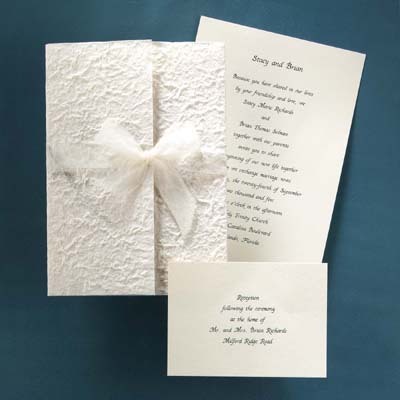 Embossed or engraved wedding invitations in thick, fancy paper are very much appropriate. You can opt for a light-colored paper with dark lettering or dark-colored paper with shiny lettering, depending on your motif. More often than not, these kinds of invitation also include a lot of custom detail. A casual cocktail reception, on the other hand, goes well with simple, personalized wedding invitations. 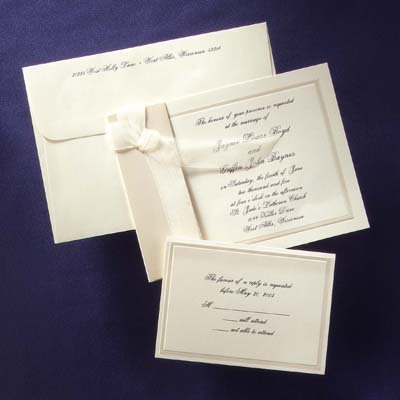 These are usually one-page invites with a brief and concise message printed on block or semi-fancy script lettering. Because it's your wedding, there's a lot you can get away with; one of which, is personalizing your wedding invitations. A designer might be able to customize your invitations the way you want it, but it won't have as much as impact as when you do it yourself. You can get your creative juices flowing as a couple and customize your invitations using DIY invitation kits and software. A very good way to personalize is to include a photo of you as a couple. This is a particularly good idea if you are inviting people from long distances who know only one and not both of you. This gives them a clearer picture of the other person in the couple, fostering a better connection. You can vary the photo, depending on your wedding's theme, motif, or formality. For a casual wedding, you may include a candid shot of you. A picture taken at the beach will be appropriate for a luau. For a formal wedding ceremony and reception, a photo taken professionally at a studio in formal wear is appropriate. 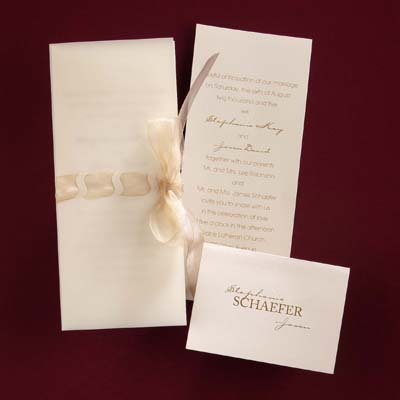 Hand-written or hand-drawn invitations are also a great way to personalize. This is a very nice way to make your guests feel that they are personally invited. It's not as hard to do as you think. A short calligraphy course can help you do simple letterings and geometric designs. You may be surprised at how it can come so easily. You might also need to put in add-ons to your wedding invitations. One of which is a reception card. This often comes in handy when the ceremony and reception are in two different locations and when some of your guests are not invited to the latter. A reception card would include directions (or a map, if you choose) to both venues. Another add-on is the reply card or the RSVP card. This is extremely helpful in arranging your guest list and seating charts. The reply card is a small card with a stamped and self-addressed envelope, giving your guests RSVP convenience. So you see, wedding invitations aren't particularly difficult to come up with. All it takes is a little and a bright idea or two to come up with the perfect invitation as a prelude to your perfect day.